Die-hard supporters of former President Park Geun-hye created their own political party on Wednesday, pledging to revive what they call a bona fide conservative movement that would vindicate the ex-leader jailed in a corruption scandal. The preparatory committee for the establishment of the Saenuri Party held an inaugural ceremony at Jangchung Gymnasium in Seoul and appointed two representatives of a civic group supporting Park as the co-chiefs. Saenuri is an old name for the former ruling Liberty Korea Party, which is now struggling to recover from the repercussions of the unprecedented corruption scandal involving Park. "The Liberty Korea Party and the Saenuri Party will compete for a free democracy as they are from the same roots," Rep. Kim Jin-tae of the former ruling party said in a congratulatory message. The new Saenuri Party does not have a representative in parliament. 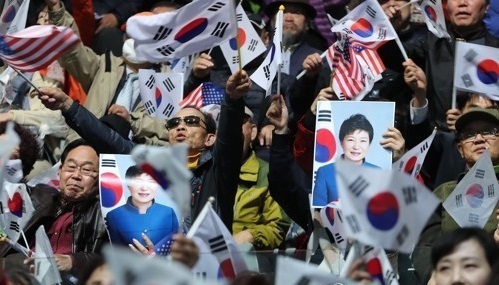 Park's loyalists have been staging outdoor rallies against the Constitutional Court's decision to uphold her impeachment on March 10.